This answer from a high school coach in Washington stunned me when I asked about the difference in Oregon Spring Football compared to years in the past. This is the time of year when coaches come in from across the nation to meet the Oregon coaches, “talk football” and watch the practices and drills. They are here to learn more, and I spoke with a few concerning their reaction to what they saw and felt about this new Oregon football staff. The reaction above was actually the norm in my interviews, although it is interesting to drill down and find out why this staff is so different from those in the recent past. These coaches asked to speak on condition of anonymity, not because their comments had any special meaning, but because of their friendships and relationships with the coaches of the past regime. One interviewee noted that National Defensive Back Coach of the Year Charles Clark will have 75% of his former defensive backfield at Colorado drafted in the upcoming NFL draft. What is remarkable is that this is not USC or Stanford recruiting. You remember how bad the ‘Buffs were three years ago? (The players who joined them were not highly sought-after talents.) 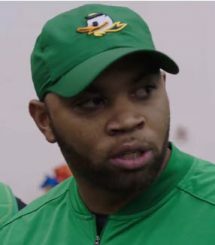 They became extraordinary due to this coach, who is now on the Duck staff and has already garnered a reputation for teaching the tiniest details in technique. Coaches I spoke with remembered two Ducks football coaches making it clear that the goal is a National Championship, and their passion reflects their desire for this ultimate prize. A story about head coach Willie Taggart emerged: we have heard in prior interviews how he wants to be the first African-American coach to win a college National Championship. He has been fixated on this goal for years, and he believed when he took the University of South Florida job that that goal was attainable. He could not have seen South Florida parting ways with the Big East (part of the BCS at that time) to move to the non-BCS-league Conference USA, only two months after he accepted the head coaching position with the Bulls. Yikes. Thus he knew that he would eventually have to leave USF to achieve that burning goal within, and when the Oregon job came up? I believe that was true. Coach “T” has rebuilt two prior programs, so this is not his first rodeo. Thomas Graham wins another confrontation. Defensive Coordinator Jim Leavitt has made it known that he likes to blitz a ton. Thus his corners will be employing one-on-one press coverage often. The word from one discussion I had was to watch for much better up-close press coverage by the corners at the Spring Game. Hence, the movement of corners coach Clark from Boulder to Eugene was essential for Leavitt’s aggressive package. Boy I love the sound of this group of new coaches at Oregon! One coach told me that, in one of the first meetings between WCT and the players, the players were lounging in the stadium seating in the Hatfield-Dowling Complex, playing on their cell phones and generally not giving their full attention. The coach’s reaction was to eject players from the meeting room and tell the team how they are to operate during meetings in future. Apparently, it did not take long for the behavior to change! The second story involves an early meeting where Coach Taggart told the players that “Coach Helfrich was not fired because he is a bad coach, because I know he is a good coach. He was fired because you would not do what had to be done — when it had to be done.” Whoa! That is not a way to endear a brand new team to you, and it was certainly a warning shot about how things were going to be run … Whew! I understand how we have all heard about the “juice” from this new coaching staff, but the comments I heard most were about this energy exuding from the current staff that was absent from the prior one. The number of statements concerning this was surprising. 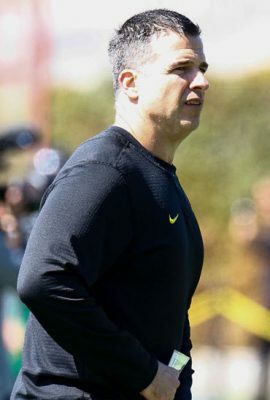 One coach spoke of how, “Mario Cristobal has a passion for the details of offensive-line blocking that I’ve never seen.” The improvement of the offensive line in key drills centered around power, in just two weeks was astonishing to the fellow I spoke with. Mario Cristobal watches his offensive line. The term “power” came up often in my conversations — how coaches wanted to see more of it from their position group. One interviewee reported how coaches on both sides of the trenches wanted their players to be tougher and to intimidate the opponent when given the chance! (My heart skipped a beat hearing that, as I have lusted for linemen who are worried less about a “drop-step” and more about kicking the crap out of whoever is lined up across from them.) I became very excited hearing about the coaching in the private drills and film-room work concerning the new ‘tude. Apparently, the new coaches have not just been super-energized during practice; they have even jumped in and been a part of the drills! 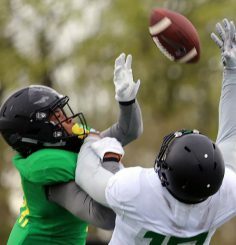 Competition is emphasized in many of the drills, and quite a few have never been done on the Oregon practice field before. The desire to win brings out the juices in the assistant coaches who take these mini-tests of their players quite seriously. 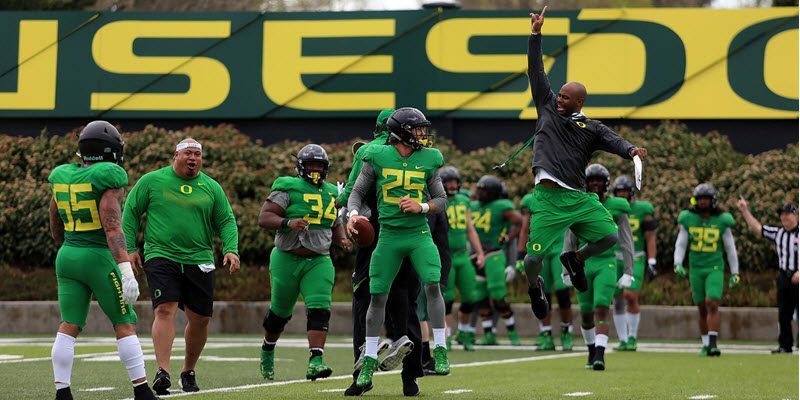 Do look for my article this Friday about what to watch for in the Oregon Spring Game as I am already assembling a list from our Coaching Consultant team at FishDuck.com.